Excellent article written by Kaithe Greene over at tefl.net about workplace bullying in the EFL industry. While the article is ostensibly about the EFL industry, I found it mainly provided some very good overall information about bullying. However, it really got me thinking about the problem and specifically how people working as English teachers in foreign countries could be affected by bullying. Whether in a public school, a private institution, a language centre or a university, bullying is something that could have an impact on all teachers at some point in their careers. The tefl.net article provided a definition of bullying and a list of behaviours that is quite thorough (though I will comment on that later in this post). Two items from the list especially struck me as the kind of deceitful actions that are very common and are things that people are able to get away with. First, "withholding information which affects performance." The old "I forgot to tell you by accident on purpose" stunt. I find this is something that could very easily happen in the TEFL workplace. Especially because in some cultures there is often trepidation on behalf of the local teachers or staff to communicate with foreign teachers. They very often ask one foreign teacher to pass on information to others. Selective forgetfulness is a real possibility. Second, "spreading gossip." One of the most vile and toxic behaviours in any workplace, it can be even more destructive for someone working as an English teacher in a foreign country. Because the possibility of feeling isolated is always present for the expat, knowing that there are shameless cowards spreading lies about you can be extremely frustrating. It is important to qualify exactly what type of gossip I am referring to here. It's nearly impossible to never mention someone's name when they are not around. Perhaps you had a work-related interaction with another teacher and now you are passing that information on to someone else. Even in this type of situation, it is very easy for someone to throw in a negative comment and things can quickly turn nasty. Far more insidious are dedicated back-stabbing sessions where two or more individuals get together and rip another teacher. I have been in a staff-room where one shameless individual announced that he had some gossip to share. It must have thrilled him when a few other like-minded people shot up from their seats and rushed over to hear the latest dirt. In this case, I remained where I was and indicated I had no desire to listen in. The problem with gossip is that to counter it, you are almost obliged to engage in the same kind of behaviour. In a perfect world, you would hope that people who hear someone insulting another person behind his or her back would not respond and would only form a negative opinion about the creep spreading the gossip. You would also think that if a particular teacher is constantly belittling various people when they are not around, that the listeners would assume that perhaps they too are getting the knife from the little smear-artist. But it rarely works out that way. A gossiper will never have trouble finding like-minded people and targets. Maybe the gossiper even has some legitimate grievances against his targets. But instead of respectfully confronting the individual, he will go with the easier option of ripping the person behind his back. And of course, it will go beyond the initial grievance and will turn into a kind of addiction with plenty of positive reinforcement from other gutless weaklings. So what should you do if you find yourself the target of a gossiper and his little sycophants? First, the trouble is determining if you actually are the target. The only real way to know is if the gossip comes back to you in some way or if a teacher you know and respect informs you of the gossip. When you have confirmation and decide to counter the nastiness, inevitably you will be taking part in the same kind of behaviour you loathe. You can also confront the individual who is the lead defamer. As the article I am riffing off mentions, you may want to tape-record such an interaction. That is fraught with its own perils as gossipers are often skilled manipulators and could turn such an action into something sneaky and underhanded in the eyes of his followers. However, when you feel threatened and feel your job and family could be affected, tape-recording a conversation with someone who has been maligning you is acceptable in my opinion. It is even more acceptable because of the fact that gossip does influence people regardless of how baseless it may be. I wish people always formed their own opinion on others based only on their own one-on-one interactions and other direct observations, but that isn't always the way things happen. Another thing you definitely should do is develop your own elevator pitch on gossiping and repeat it whenever you sense a gossip session developing in your presence. It could be something as simple as "Sorry, I think that gossip in the workplace is toxic and we should avoid it at all costs." This can even be a way to get a discussion going on the destructive nature of gossip in the workplace. If you decide to do this, and I believe you should, then you must adhere to it strictly or risk being labeled a hypocrite. As mentioned, the only situation in which it may be acceptable to gossip is when you are countering things being said about you. Still, very risky. Discussing the negative effects of gossip may even make some people moderate their conduct. Amazingly, some people may not realize they are such shameless gossips or may not be aware of all its damaging effects. The two types of conduct discussed above: 1) failing to pass on information to a colleague so as to damage his reputation or ability to perform his job, and 2) gossip, fall under the category of passive-aggressive behaviour. The easiest kind of bad behaviour to get away with in the workplace. Show me a nasty little gossiper, and more often than not, I will be able to show you a chronic late-arriver—another classic passive-aggressive manifestation. This is not to suggest that all punctually-challenged individuals are gossipers but I believe there is often a correlation. Another weapon used by the passive-aggressive type is the silent treatment. Another cowardly method of failing to deal with various situations in the workplace in an honourable and mature way. The silent treatment is another low-life tactic that people can get away with and it can make their target feel excluded. 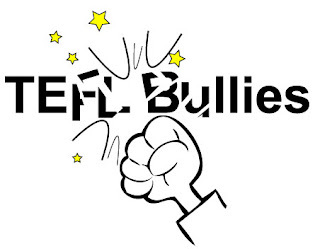 Other types of TEFL workplace bullying exist that people more commonly associate with the playground bully. In other words, violence and aggression. The article at tefl.net uses a multi-point definition of bullying that "stresses the negative and ongoing nature of bullying as opposed to an occasional display of aggression or unfairness." However, I think that definition misses the point that aggressive behaviour can also be ongoing. Perhaps the assumption is that something so brazen in the workplace simply couldn't go on for very long without being detected and sanctioned. But in fact, it can. And some of the unique aspects of the TEFL workplace in foreign countries make that even more possible. Now I will answer one of the questions posed by Kaithe Greene in her article on workplace bullying in the EFL industry: "is it [bullying] any different in the EFL industry to any other workplace?" In particular, in some Asian cultures and some types of educational institutions, the conditions are in place to allow the bully to get away with actions for a longer period of time than they would otherwise. As mentioned, in some cultures there is still some uneasiness in interacting with foreigners, even if they are colleagues. The sentiment that "they (native English-speaking EFL teachers) are a necessary evil" does exist to some degree. With this comes the tacit understanding that disputes among foreign teachers stay among the foreign teachers. This sentiment is further strengthened by the foreign teachers themselves who don't want to cause problems for their hosts or to perpetuate any possible negative stereotypes about foreigners that may exist. In addition, there is a certain kind of thinking that is ingrained in most people at an early age that benefits cowards, bullies and criminals. It results in the belief that to ever take a concern to someone in a position of authority is the most reprehensible and unforgivable sin possible. The fact that so many people continue to believe in these juvenile concepts long after they have become adults, thrills bullies to their manipulative little cores. The notion that informing those who sign your pay-cheque about someone in the workplace who is out of control is somehow worse than the original bad behaviour, gains traction with many, many people. Bullies understand this and use it to their advantage all the time. Listen to a bully start puking up sad clichés that reflect this kind of thinking when his behaviour is finally highlighted. Things like "grassing" and "can't deal with things on your own," all delivered with indignant outrage. Anything to deflect attention off the initial actions that may have led to a person trying to protect himself. Again, many people will fall for this type of garbage. The problem with dealing with the most unhinged bullies is that while they often engage in some of the passive-aggressive behaviour discussed above, they can also be, at times, tantrum-throwing wackjobs. At first, the two don't seem to go together: passive-aggressiveness and the kind of outbursts associated with adult temper tantrums. But in many ways they are similar and can be displayed by the same individual. Both involve the inability to deal with things in a straightforward and respectful way. Someone who throws temper tantrums is usually responding to the outrage of another person daring to disagree with him or to not do something he wants them to do. So he shrieks and yells and gets aggressive in the hopes that his opponent will back down. Sadly, many people will back down. And the bully knows this. While the ongoing nature of the behaviour seems to be one of the identifiers of bullying, in the case of violence, a single act can have long-lasting effects. Imagine, for example, if a tantrum-thrower committed an act of vandalism in the staff-room. The coward would be unlikely to have the guts or decency to stand up and take responsibility and would count on most people not getting involved and not "ratting" on him. So the cowardly bully continues on and the shadow of suspicion hangs over others as a result. There also may be some reason to believe that the individuals who work as English teachers in foreign countries are more damaged to begin with and thus more inclined to engage in sinister, bullying behaviour. In Bangkok Filth, there are a number of stories that involve the EFL workplace. One theme that emerges is the alienation that many expats experience and the irony that instead of helping each other through difficult times, foreigners living in Thailand often turn on each other. Finally, the point is not to bend to the will of the workplace bully or let him get away with either his passive-aggressive behaviour or his temper tantrums. To accept the bully's way of dealing with things will only result in further bad behaviour from him and in the end, a situation that escalates. In the TEFL staff-room in a foreign country, this is a sure-fire way to violence. And even if you are able to mash the coward's head into the concrete, it's not worth it because you will be the one who ends up in prison. While it's a good bet that the bully is also a feckless wonder whose other actions in the workplace may eventually trip him up, the sad reality is that often, the bully wins. Still, take steps to protect yourself and remain as professional as possible at all times. Ken, you may well be right that bullying in the EFL workplace is different to in other workplaces. Due to my lack of experience in other workplaces I can't claim to be an expert on this. One thing that became clear whilst I was researching my article was that in some countries there exists legislation designed to deal with this problem. Yes, it's complicated and time consuming, but legislation, and sometimes support in taking legal action exists. Yes, it's difficult, challenging and stressful, but it is possible to take legal action against an employer who doesn't fulfill the legal obligation to provide a safe working environment - and I am informed that allowing one person to do psychological damage to another is within the scope of the relevant law in both the UK and Australia. However, if one is in a country where one doesn't understand either the language or the law particularly well then one is at an even greater disadvantage. Faced with such a situation most of us might find our sense of self preservation takes over and we simply just pack up and p*** off! Withholding information was a tactic used against me when teaching in Japan. Sometimes you just have to stand up and fight your corner in a workplace. The best way to do that is in an honorable way which will often end up with the bully showing their true colors to the rest of the workplace.